We also include files to stitch 1, 2 or 3 of the small key chains at a time in 5x7 hoop (color sorted for quick stitching). 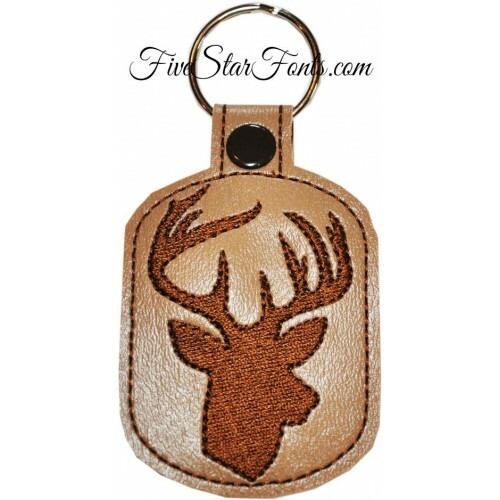 Plus we include files to stitch 1 or 2 large key chains at a time. 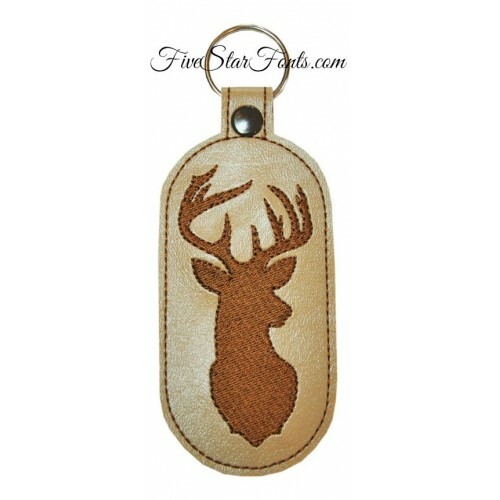 Perfect for hunters or those who love wildlife. Great stocking stuffers and perfect for craft shows. Stitch the large one in Pink, perfect size for ladies purse. Add clear vinyl on the back of the large one - it's a perfect luggage tag! As with all of our in the hoop designs, complete step by step photo instructions included in PDF. Supplies needed for this fun, fast and useful in the hoop design include Marine Vinyl (we include where to purchase it in the instructions included). 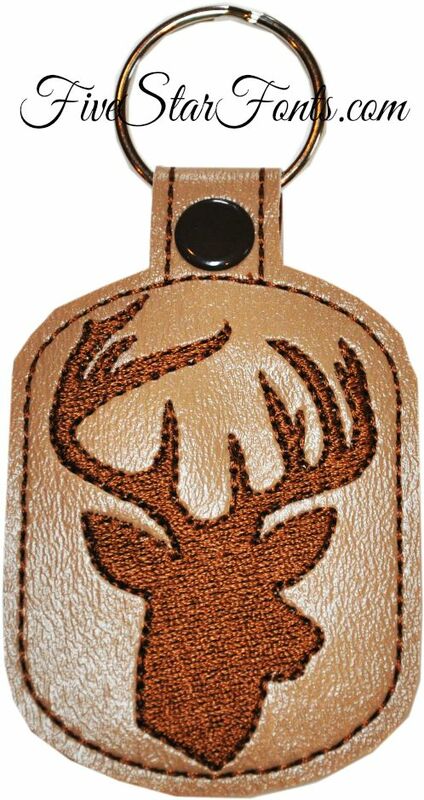 You can use fabric or felt but we prefer Marine Vinyl as it holds up best for key chains. You also need One set of snaps. We prefer size 16 from snapsource.com You also need a split ring - 1 1/4 inch size. ** Made completely in the hoop in 1 hooping. Super simple and lightning fast to make. ** Single, Double and Triple files included so you can stitch 1, 2 or 3 at a time in 5x7 hoop (small keychain). Color sorted for easy stitching. 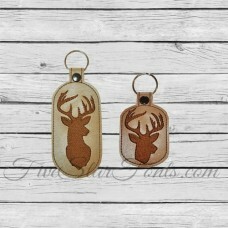 **Single and Double files included so you can stitch 1 or 2 at a time (large keychain). Color sorted for easy stitching. 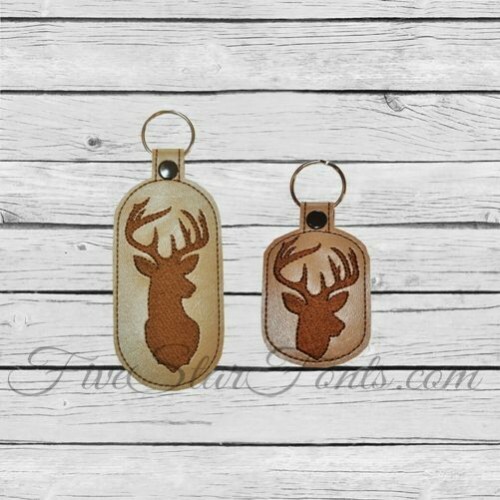 (5x7 Hoop) Large Size - 1 Key Chain - 2.17" x 6.05", 2 Key Chain - 4.89" x 6.05"
Small Size: 2.00" x 3 1/2"
Large Size: 2 3/8" x 5 1/4"
Please make sure your hoops are large enough to stitch the design sizes shown above as we don't offer refunds if the design doesn't fit.This is a perfect design for those new to embroidery or new to in the hoop designs. The seasoned pro will love how fast and easy they are to make!